Using laser-cutting, off-the-shelf hardware and Arduino, you can make your own simple 3 axis robot. 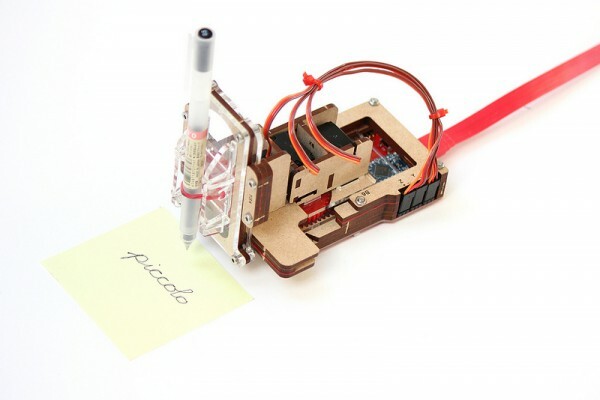 Attach a brush or pen to make a quick drawing robot, or extend Piccolo with sensors, custom toolheads, or by using multiple Piccolos together. Experiment with 2D or 3D digital fabrication at a small scale! This entry was posted on Thursday, December 4th, 2014 at 11:00 pm	and is filed under open source, robotics. You can follow any responses to this entry through the RSS 2.0 feed. You can skip to the end and leave a response. Pinging is currently not allowed. Piccolo is limited to 50mm cube. That means writing in 50mm x 50mm square (2 inch x 2 inch). I’d buy one if someone like Adafruit sold the laser-cut parts BUT I’d prefer a writing area of about 148 x 210mm. That’s A5 paper. I can’t tell the size of the notebook page used in the video, but it isn’t too small. A6 (105 x 148mm)? I definitely want something that can print to at least 90% of a notebook page. Look at the video. Its awful. At 0:14 it tries to draw a spiral. At 0:18 you see some samples. I’m not sure what other use beside “see, it moves!” it can have. I’m possibly going to get slammed for what is an obvious plug for my own product, so apologies in advance, but I thought I might at least mention it after Alan’s comment about needing a larger drawing area. I have a kit for a drawing machine with a maximum area of 18x16cm, operating from the EiBotBoard. I won’t bore you with details here – have a look at the website http://www.axidraw.com if you’re interested. Regarding actual Piccolo machine, they’ve done a remarkably good job considering the constructional methods and materials used, and the use of servos to drive the axes (rather than stepper motors, which are a bit more complicated to use). Tolerances in linear slides built this way will always be a bit “iffy”, so it’s pretty impressive that it can do recognisable handwriting. 315 pounds is 591 dollars Australian – and I’ve just bought XMas gifts… darn.